This file performs principal components analysis (PCA) and displays the results for the data at each stage of our data transformation pipeline. Furthermore, it quantifies and tests the PCA results using pca-utils (commit 8540ff2). The methodology is described in Worley et al., 2013. Briefly, the differences between samples are calculated using the squared Mahalanobis distance. The distances are then scaled so that the hypothesis test that the samples from two groups come from separate distributions can be computed with an F-test. Input Poisson GLM transformed molecule counts per million. Input final batch-corrected molecule counts per million. 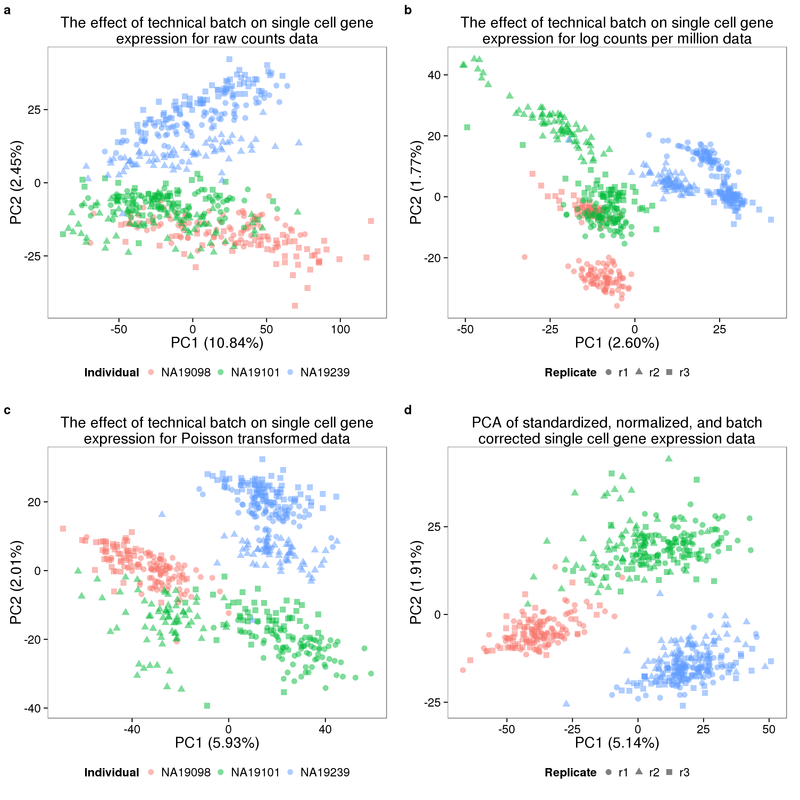 pca_molecules_filter_title <- "The effect of technical batch on single cell gene expression for raw counts data"
pca_molecules_cpm_title <- "The effect of technical batch on single cell gene expression for log counts per million data"
pca_molecules_cpm_trans_title <- "The effect of technical batch on single cell gene expression for Poisson transformed data"
pca_final_title <- "PCA of standardized, normalized, and batch corrected single cell gene expression data"